The Delhi High Court reserved its order on a petition of private bus operators seeking stay on the Delhi Government's decision to phase out Blueline buses from the Capital roads till January 31. A bench comprising Justices A K Sikri and Suresh Kait after hearing arguments from both the petitioner and the Delhi Government for several hearings, reserved its order. The Delhi Government had issued a notification just before the commencement of the Commonwealth Games and initiated to phase out about 1600 Blueline buses from the capital, especially from the NDMC areas to ease out traffic for the CWG. The government introduced low-floor buses in these areas and in the first round, 1600 private-run Blueline buses went off the roads. However, about 865 of them were allowed to ply as there was no substitute for them. 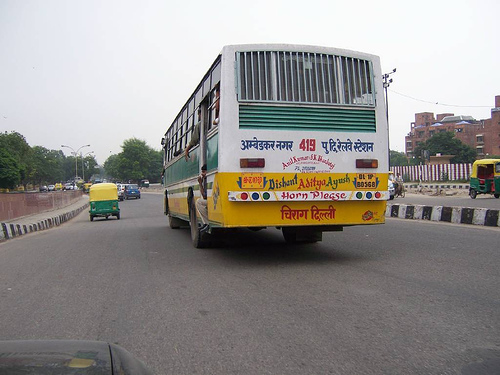 Some buses were allowed to ply after the CWG again, as there was no alternate arrangement of transport on those routes. The Bus-Operators association has approached the Court, saying they should be allowed to ply on the roads till low-floor buses are introduced so that commuter does not suffer. The operators have also urged that they should be allowed to participate in the cluster system, a government-run scheme, whereby area-wise routes are allotted to a bus operator, who can cater to commuter in the area with his fleet of buses. The government said it wanted to phase out the Blueline buses from the capital roads as they were a threat to commuters.